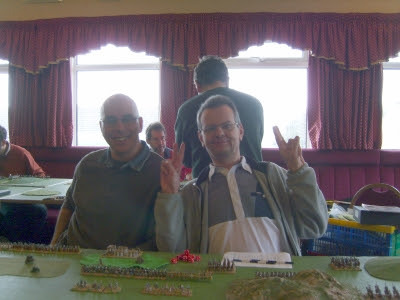 I know you’re all dying to know how Graham & I got on playing in our first ever Field of Glory competition at Halifax. I won’t be boring you with blow by blow accounts of the games as a lot else happened. So here goes. The day got off to a bad start. I was woken at 3:00 am by a really bad mouth ulcer. It proved better than the alarm clock at helping me rise at 6:45 am. The trip to Halifax was straightforward if wet and foggy [sic]. I was glad there wasn’t much traffic. I found the venue easily enough and arrived in plenty of time to relax before the games began. I was surprised when Graham arrived soaking wet just after 9:00 am. I didn’t think it was raining that heavily! Anyway it turned out that I’d driven straight past him on my way to the venue as he trudged up the long hill from his hotel; great teamwork there. Luckily he’d had enough coffee for the rain not to dampen his spirits. In fact most of his spirits seemed to have been left over from the night before but that’s another story. 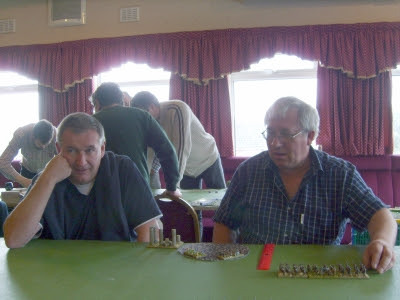 As newcomers to the Northern League for 2010 we were naturally playing on the last table of the nine in use on the day. By the time the first round draw was made Graham was drying out nicely; on the outside that is. This is a picture of our first opponents, Steve Telford and Eric Jonsson. I apologise for the poor quality of the picture; the flash didn’t work on my camera all day due to an incompetent user. They were newcomers too. In fact they gave us the same opening speech we’d prepared. Graham lost the initiative dice roll. Steve & Eric placed agricultural terrain. We were using a Mongol army so we were hindered right from the beginning as one flank was effectively closed with two steep hills. In the game the combination of terrain, bow power and heavy foot proved too much for us. Our attempts to break through on the flanks didn’t work. Early on we had one chance to create chaos on our right but were repulsed and we were on the back foot from then on. Steve & Eric were great opponents: patient, relaxed and really nice blokes. They cruised to victory with 15 minutes to spare and deserved their win and bonus points. Although I’m not so sure they remained pleased for long; their big win earned them a very tough second round game against league leaders Dave Ruddock and David Eltringham. I consoled myself with lunch whilst Graham had a couple of pints. Our second games was against Dave Finnegan and Chris Proudfoot. Like us they too were new to “competitive” FOG. It quickly became clear that they were experienced wargamers and good blokes to boot. The beer worked! Graham won the initiative and the battle took place on the Steppes. The highlight of the terrain deployment was Chris’s use of different coloured leopard skin cloth as terrain pieces. The game was delayed when Chris referred to these as “underpants” resulting in much laughter and some quite frankly disturbing mental images. The late Roman army contained a lot of cavalry and was, at 17 battle groups, a lot larger than the 12 in our Mongol army. This didn’t matter; within the first three or four turns Chris had lost three battle groups to shooting and their left was in real trouble. As much as the dice went against us in the first game they went for us against Dave and Chris. They pressed on against our left and centre but at considerable cost. The losses on their left meant one flank was completely open and inevitably their losses mounted. The game ended well within the time allowed when we took their camp to break their army. A pleasing day’s tally of 23 points out of a possible 50. Not bad for our first outing. As I wrote in mid April, we entered this competition to test how far we’d come as FOG players and I think we passed. Our first game of FOG was on 04 April 2010. Five and a half months later we were able to participate in a couple of open, competitive games without making complete fools of ourselves. This is encouraging and it looks like we’ll be entering the final round in Manchester in November. We’ve learnt a lot this year and I’m going to summarise it all in a future post but there’s one thing I must mention here. Next time I’d like to sleep a bit better the night before. I’m sure this is why we played both games with only three generals and not the four that were on our list. The results for the Halifax round are now online and there's also a more complete analysis available.